According to our sources, a new highly sort-after publication of The Slav Epic is due to be released by Albatros Media. The Slav Epic book, authored by Jan William Drnek, rumoured to be titled epos, is due to be launched on 25th April at 5 pm in The National Library of the Czech Republic, Clementinum, Prague. 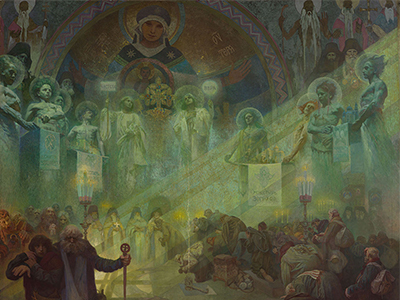 The limited-edition publication is to be the first of its kind in the world, a digital reproduction of Alphonse Mucha’s The Slav Epic. With the use of special printing techniques and high-resolution photography the book should allow viewers to study The Epic in the finest of detail. The launch event will mark 100 years since the exhibition of the first five painting in the cycle. As well as the high resolution images of The Slav Epic, the book will likely contain some information about the history of the world famous cycle also. The book is housed in a refined case that acts as both a cover for the book as well as a display stand. That’s all the information we have for now, until the unveiling of this one-of-a-kind book takes place on 25th April.